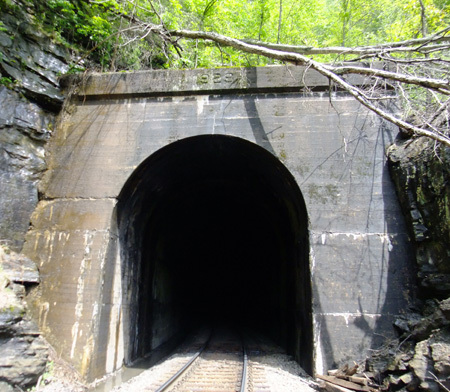 This is Short Branch tunnel, just south of Reinhart. It’s located by the McClure River (I think that Short Branch is a creek somewhere in the area) and is 913′ long at 37.152285, -82.372719. The reface date on the portal is 1930. This is looking toward Elkhorn City and that’s me heading up to take a look into the tunnel. 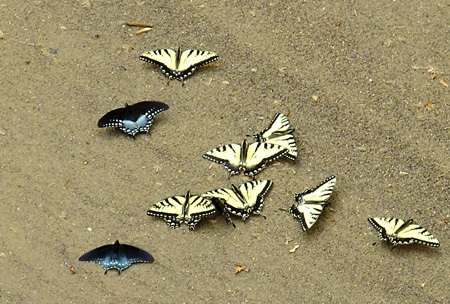 On the way across the creek by an old, low concrete bridge, we saw an amazing group of butterflies on the shore. The picture is titled “Butterfly Airport”. Butterflies, I found out later, have an affinity for dung heaps. I feel differently now about butterflies. We felt we really hadn’t made enough effort to document the eastern portal of Pine Mountain tunnel. My buddy acquired two sets of waders. And we needed them. The distance is short, but the way was uncomfortable in a number of ways. There were some sort of reeds that were dead, but towered well over our heads. See the picture of Lee (my hiking buddy) as scale. There were also briars, cold water as deep as a couple of feet, with mud a little deeper…oh, and downed trees across the way. Not complaining, you understand, because seeing the portal was informative. James Goforth in “Building the Clinchfield” (ISBN 1-57072-191-9) says that Pine Mountain is located in “a highly disturbed fault area”. 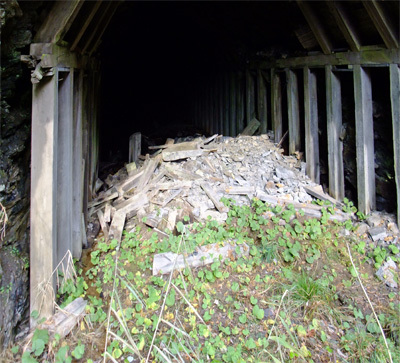 When I looked into the portal (on left), I saw what 53 years of neglect has produced: the roof of the tunnel is falling in. 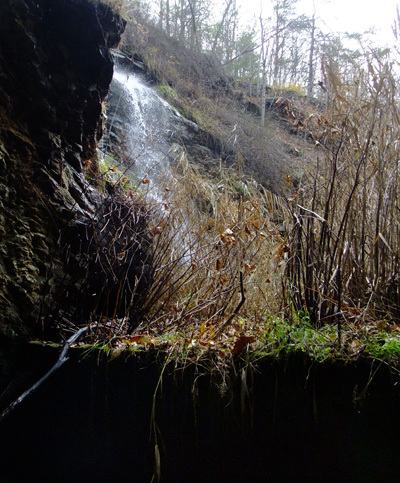 With a strong light, Lee was able to see more rockfalls further down. We also saw where all the water was coming from. The water is blocked from coming into the tunnel by a 4′ or so high cinder block wall just at the portal entrance. After we sloshed and squished out to the car, we went over to Jenkins to access the western portal, but came to a locked gate. We decided that we’d had enough mud for this day and promised to come back later. However, I did take a shot of the abutment of a railroad bridge that apparently crossed an existing road as the line went on down into Jenkins. 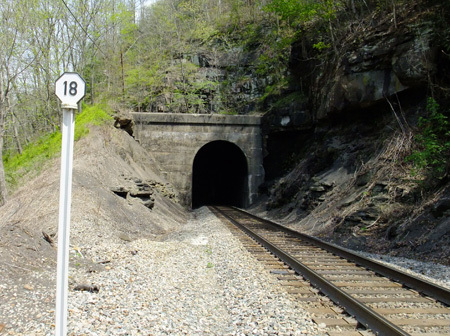 Here it is, Reinhart tunnel, 617′ long and with a 1924 refacing. It’s just across a trestle over Hwy 63 from Perkins tunnel. It centers at 37.157979, -82.372536. When I checked this tunnel out on Google Earth, I noticed that there’s an obvious track of the tunnel in the overburden. That was the first time I’d noticed that, but it happens with nearly all tunnels, unless the overburden is quite thick. Here we are at Perkins tunnel and, as you can see, we’re 18 miles from EC. It’s 496′ long and was refaced in 1917…the date’s clear, but I went for the scenic shot, so you really can’t see it in this picture (but you do get to see the neat mile marker). 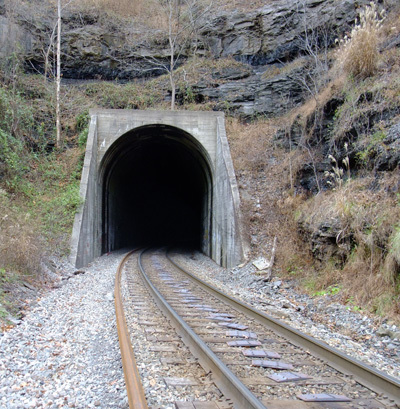 This tunnel is at 37.161187, -82.370361, about .5 mile west of Clinchco. Since I mentioned Squirrel Camp tunnel (668′), I’m posting it. It’s close to Sykes Mill tunnel, anyway…near Clinchco on the McClure River. 1929 is the refurb date. When we got to this tunnel, we realized that we didn’t know when the next train could be due…they were running at about a half hour apart, we thought. We didn’t want to be inside the tunnel when a train came through, so my hiking buddy, ever the optimist, suggested we just circumvent the tunnel by going around it on the river side. He even thought he saw a trail down there. About a hundred feet in, we realized there wasn’t even a trail down there, but we decided to push ahead. It was probably a little under a mile around to the other side, through dense undergrowth, bushes, small trees, large trees, damp glop and other lovely stuff. I managed to crack the view screen on my camera ($100 to repair, fyi). But we made it and stood on the other side huffing and puffing and then it dawned on us that we hadn’t heard a train go through. And didn’t see another the rest of our time there. 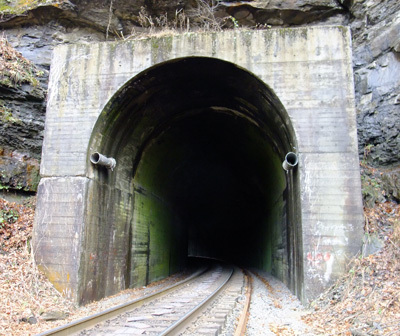 This is the Virginia (eastern) portal of Pine Mountain tunnel, blasted out in 1947 and sealed up, at least from the Kentucky side, in 1958. It’s just off Highway 667 above Almira, if you’re coming out of Pound. The access is at the “Red Fox Trail” sign, but don’t expect an easy way in. 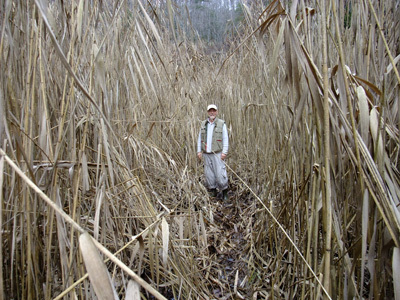 The railbed is heavily overgrown with high marsh grass and there was a lot of marshy goop around. We leaped, gazelle-like, across a creek and climbed up to the top of the cut and pushed our way through trees, some briars, and other of Nature’s finest obstacles, to where we could get a fairly clear view of the portal. 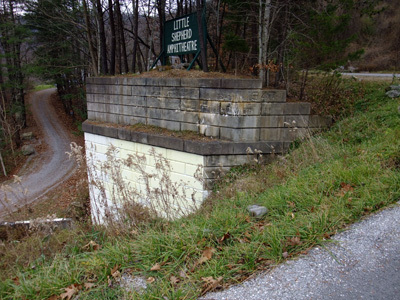 You actually can’t see it in either of these pictures, but on that light-colored band across the top of the portal is written “1947 PINE MOUNTAIN TUNNEL’. 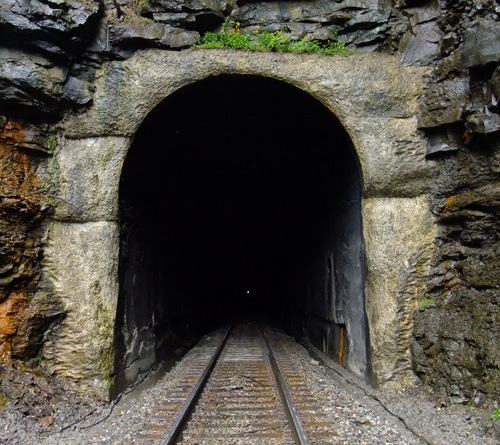 The Chesapeake and Ohio railroad created this tunnel in order to open up a vast (300 million tons!) 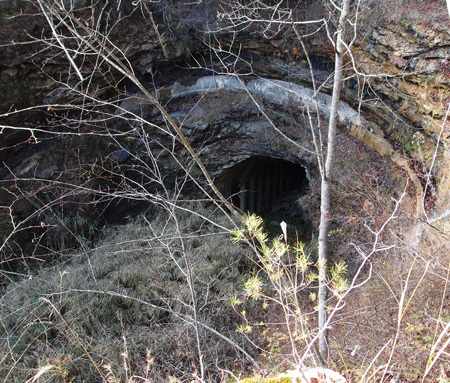 coal field just east of Pound VA. A big thank you to Chris Balthis for providing me some rich research material on this nearly forgotten tunnel. Here we are near Clinchport in Dickenson County, looking toward Elkhorn City (we’re about 11 miles now from that storied site). 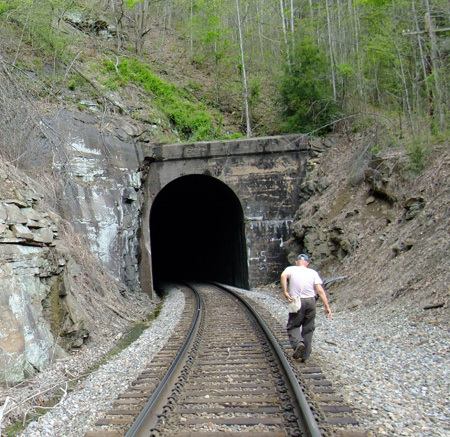 This is Sykes Mill tunnel, 752′ long, through a rock spur that runs down to the Clinch McClure River. This is convenient tunnel to photograph, since it’s practically sitting in your lap when you pull off 63 onto a side road that crossed the tracks. Not like Squirrel Camp, and I’ll tell you why later (it’s #15). And thank you to Rodney Adkins, who corrected the error on the name of the river. He also added that this tunnel is near Clinchco. This is the longest tunnel on the old CC&O. That little white dot in the lower middle of the tunnel is 7,854′ away. The other portal is actually refurbished, but I like this portal. It resembles the original facing that the Southern used on some of its tunnels…they’re usually dated about 1908 or so. Since this is another line, it may be more recent. 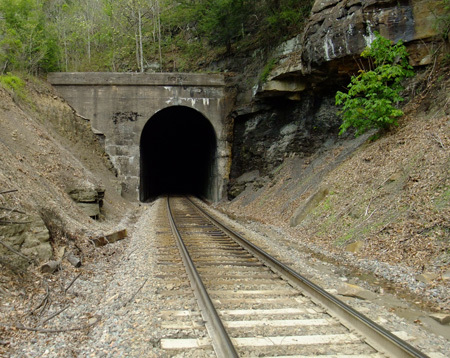 This tunnel is just south of Trammel in Dickenson County, approximately 33 miles south of Elkhorn City. 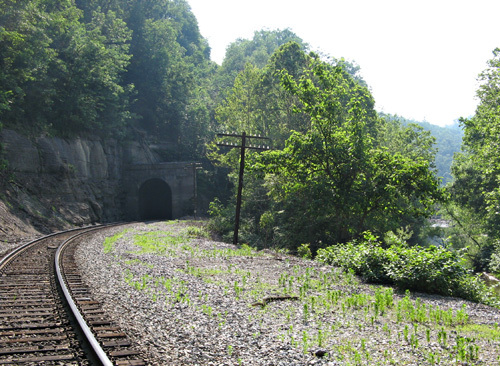 There is another Sandy Ridge tunnel, on the N&S, just 6+ miles to the northeast of this one. It also goes from Dickenson into Russell County.